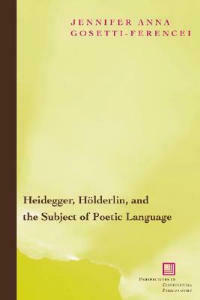 Heidegger's interpretations of the poetry of Hoelderlin are central to Heidegger's later philosophy and have determined the mainstream reception of Hoelderlin's poetry. Gosetti-Ferencei argues that Heidegger has overlooked central elements in Hoelderlin's poetics, such as a Kantian understanding of aesthetic subjectivity and a commitment to Enlightenment ideals. These elements, she argues, resist the more politically distressing aspects of Heidegger's interpretations, including Heidegger's nationalist valorization of the German language and sense of nationhood, or Heimat. In the context of Hoelderlin's poetics of alienation, exile, and wandering, Gosetti-Ferencei draws a different model of poetic subjectivity, which engages Heidegger's later philosophy of Gelassenheit, calmness, or letting be. In so doing, she is able to pose a phenomenologically sensitive theory of poetic language and a "new poetics of Dasein," or being there.